I entered the lottery and got in. I figured that if the universe wanted me to run a marathon, it would make sure I got selected. I was selected, and I started the journey of training for a marathon, first in Miami and then in Chicago when we lived there from 2014-2015. Going into that first marathon, my goal was to go sub-4:30. My time that year was 4:07. My first experience with the marathon was much-like my experience with becoming a mother: the training was the pregnancy, the race was the labor, and getting the medal at the end was like being handed a brand-new baby. 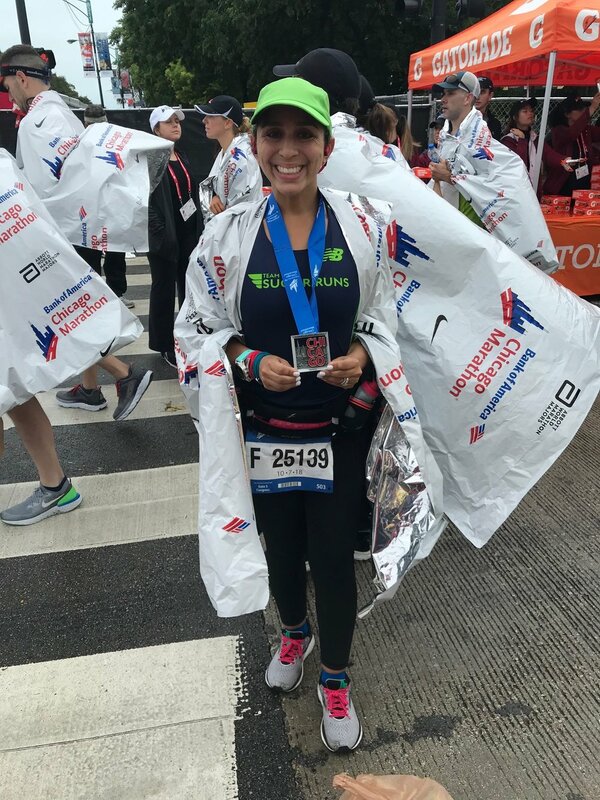 There was lots of joy, even more love, and an indescribable amount of pride over what I had done to get to the starting line, what I had done to get through the 26.2-mile distance, and what I had accomplished once I crossed the finish line. Marathon amnesia is REAL when you have a great race day. 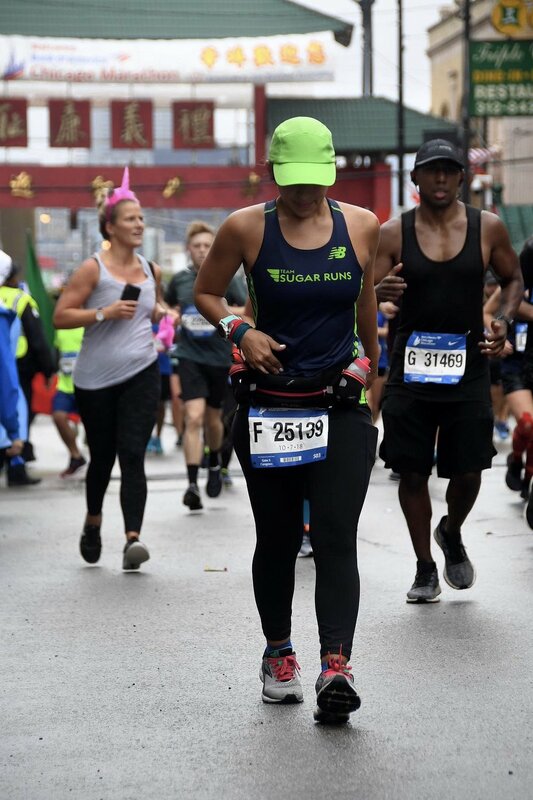 I was eager to tackle my next marathon and within a year of my first Chicago, I ran the Miami Full Marathon, Chicago Lakefront 50K, and Berlin Marathon. I celebrated my marathon anniversary by running the Chicago Marathon a second time (this time as a charity runner). I also ran the Chicago Marathon in 2016 and 2017. The 2016 Chicago Marathon holds its place as the race where I earned my PR (personal record). I went into this race with the hope of getting a time that was better than 4:07. A tough training cycle in the Miami heat and cool race-day weather helped me walk away from that race with a 3:52. I was so happy with my time but left the race wanting to work on eliminating positive splits and wanting to work on building mental strength to avoid the mental breakdown I experienced between miles 15 and 18. 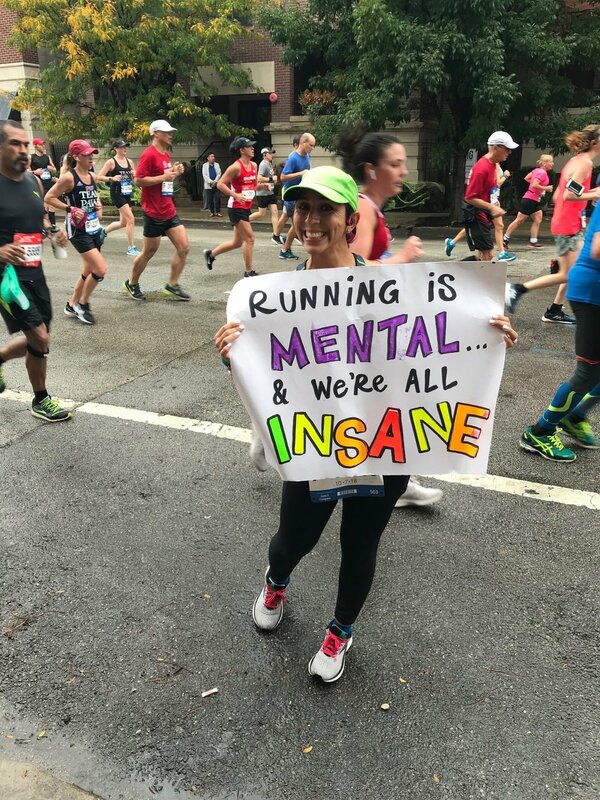 The 2017 Chicago Marathon holds its place as the race that broke my heart a million ways but solidified my love for running and my need to change my perspective on running. This was another year of training in the Miami heat and, while race day was cooler than Miami, it just as humid as Miami. My goal for this race was to match or better the 2016 time. Within 5 miles I knew I would not be bettering my 2016 time and I spent the next 21 miles of this race trying to convince myself that I could finish. I had a cramp so bad in the last two miles that I walked through the finish line. I felt disappointed in myself and saddened by my performance after this race. The worst part was that these feelings lingered for nearly three months. I still loved running, but my confidence as a runner plummeted. I knew I wouldn’t get my confidence back without outside help. I reached a point where I was tired of doubting myself. I was tired of feeling negatively toward the marathon distance. I was tired of letting one race and the time of that race define me as a runner. I thought about what I could do to get me back into the head space of being excited to run again. The answer, for me, was to hire a coach, let her create workouts, and have me just show up to do the work. After speaking to Jessica of Sugar Runs Racing, I knew I found the coach for me. After much thought, I realized that I did not truly want the goal I was working toward. I thought I did because it’s what everyone else around me was trying to do and I was letting what others wanted and were doing overshadow what I wanted. I was doing a disservice to myself and the type of runner I prided myself in being by letting the goals of others become my own. I went from being a runner whose goal was to cross the finish line with a smile to being one defined by time. I stopped marathon training and instantly was filled with relief and happiness. It’s amazing how quickly the weight lifts when you give yourself permission to want what you truly want for yourself and let go of what you think you should want or what you think others want from you. I debated entering the Chicago Marathon lottery for 2018 after my 2017 experience, but a friend told me that I should not let one bad experience muddle all the happier experiences from previous years, so I entered. Again, I entered with the expectation that if the universe wanted me there, I’d be selected. After being selected, however, my goal had completely shifted from a time-based goal to a feelings-based goal. My goal was to feel strong, regardless of the time on the clock. Jessica was on-board for this goal and began giving me workouts that mentally challenged me, physically exhausted me, and left me completely in awe of myself as a runner. I fell in love with myself as a runner all over again. There was joy in the training, even when it was hard. There was peace in the training, even when I missed a goal pace or bombed a workout. Most of all, there was gratitude in the training, knowing that I was working toward a goal that moved beyond the parameters of time. I’ve been running long enough to know when I’m training for a specific time and I knew that, while the workouts were building my confidence as a runner, they were also getting things in line for a specific time on race day. Jessica and I agreed that I would try to go for a 3:45 and that I should try and stick with the 3:45 pace group come race day. The pace group would take out the guessing game and all I’d have to do is try my best to keep up. I kept up with the pace group for about five miles before the mind games started. I saw the group slowly slip away as I went through the gamut of talking myself out of a negative place. I found my stride, but then my stomach decided it wanted to draw attention from the mental acrobatics of motivating one foot to move in front of the other. At the 13.1 miles mark, I decided that if this was the end of the race, I would be happy. I tried to find my stride again and felt strong and steady until a side stitch hit me hard at mile 21 and continued to hit until mile 24. I could do nothing but laugh at the irony of it: I overcame my mind in the first half, only to battle the body in the second half. Lactic acid, heavy and tired legs, those are things you can run through. A side stitch? You can’t run through that. Any attempts on my part to run through left me wanting to stop completely and curl over on the ground. I kept moving forward, passing all time goals I had set for myself for this race. The goal to feel strong never wavered though. I finished the race slower than 2017, but many times happier. I was proud of myself for not letting a bad race experience stop me from running the distance. I was proud of myself for showing up to that starting line hopeful, despite being crushed in the past. I was proud of myself for remembering to smile through whatever was thrown my way during those 26.2 miles. I was proud of myself for crossing the finish line. I was proud of myself because, as I said in an Instagram post, if I can SURVIVE myself for 4 hours and 21 minutes, I can THRIVE anywhere. And I AM thriving. I am grateful for a body that can run for 26.2 miles. I am grateful for a body that can move for more than four hours at a time. I am grateful for a mind that believes in ME and my ability to do hard things. There is no time that can measure this amount of gratitude. I didn’t get the time I envisioned, but I’m not broken by falling short. Running a marathon is hard work. Some days it comes together and some days it doesn’t. For as much as celebrate the PRs, we need to do to more to celebrate all the times we show up and try with all our hearts to be and do our best. Final thoughts: Running makes, breaks, and re-makes you. Remember to honor who you are as a runner and that it’s ok to redefine “strong” to reflect a mental state and not a physical one. Don’t sacrifice the joy of running by ignoring your own voice to follow the voices of others.